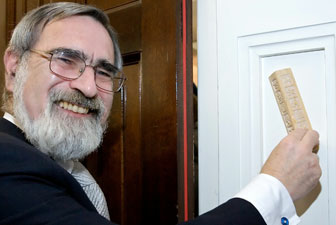 Jews affix into their doorways – of homes, rooms, offices, playrooms – a small case containing Torah passages which are hand-inscribed on parchment. This is called Mezuzah, actually the Hebrew word for an entire doorpost. It is a sign that a Jewish family occupies the home or apartment. It derives from the time that G-d instructed the people, during the virulent plagues in ancient Egypt, to place a smattering of animal blood on the doorpost as a mark of their identity; G-d noted the mark and passed over their homes. 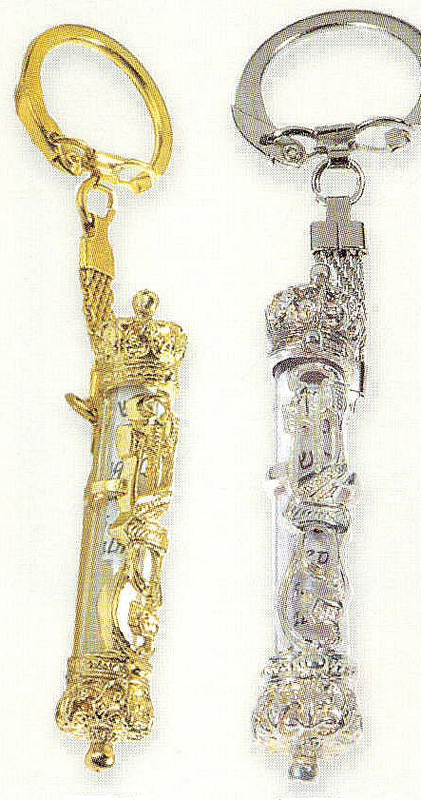 The word ‘Shaddai’ is inscribed on the Mezuzah case, as an acronym for (G-d), ‘the Watcher over the doors of Israel’. The Mezuzah is placed two-thirds of the way up the doorpost, on the right side, and at a tilt, with the top leaning toward the inside of a house or room. The case without the parchment is of no use. A parchment that is machine-made is also of no use. 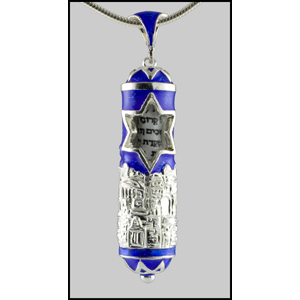 It is a custom of young Americans to wear a Mezuzah-chain, probably for self-identification, and to the extent that the wearers are proud of their Jewishness. 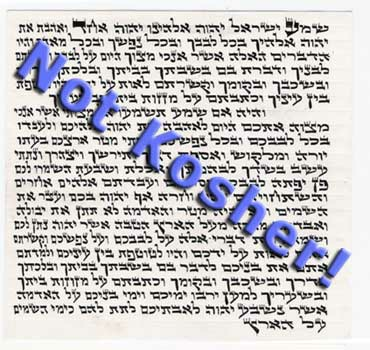 A kosher parchment wrapped in transparent tape is acceptable; the case serves only to protect the parchment and is itself without significance. 1. The Torah readily acknowledges the fact that man can easily be influenced by his environment. The keenness of his intelligence is blunted, his perspicacity impaired, his powers of analysis and selectivity dulled. He is guided by the forces, which surrounds him. He needs constant reminders that he proves of his reasoning should serve as the basis of his motivation and actions. One of these reminders is the Mezuzah. In fact, the Rabbis taught us that he who wears Tefillin, is clothed in a garment with Tzitzit, and affixes a Mezuzah to his doorpost – constant reminders of G-d’s ever-watchful eye – will never be entrapped in sin. 2. The Mezuzah consists of a piece of parchment, which is inscribed by hand and in the script used for the Torah, the two biblical paragraphs: ‘Hear O Israel’ and ‘It shall come to pass’. This parchment is first encased and then nailed to the doorpost of a home, as well as to every room therein. 3. A Mezuzah is necessary only in those rooms that are at least 16 cubits square in dimension. Some maintain that this area is a requisite only if four cubits by four cubits can be inscribed into the area. The rooms must have two doorposts with a threshold and a lintel. There is a Halachic authority for the view that if there is no door to the room, no Mezuzah is required. Nevertheless, the prevailing custom is to fix a Mezuzah. It should be a permanent and respectable human domicile. This, of course, excludes toilets, bathrooms and Mikvahs. It also exempts synagogues, because they are already identified with sanctity and thus need no other manifestation of G-d’s presence. The feather of a kosher bird, mostly turkey, and special mixture of ink. 4. The Mezuzah should be fixed slanted on the doorpost, with the top tilled toward the inside of the room. Except in Eretz Israel, where the ritual must be performed immediately, the occupant of a new house has 30 days to affix his Mezuzah. Rabbi Ahron Halevi (1235-1290), Nachmanides (1194-1270): The same reasoning that is behind the Mitzvah of Tefillin, also applies to the Mitzvah of the Mezuzah. That is, the Mezuzah serves as a reminder of G-d’s Omnipresence and the obligation of every Jew to have faith in Him. 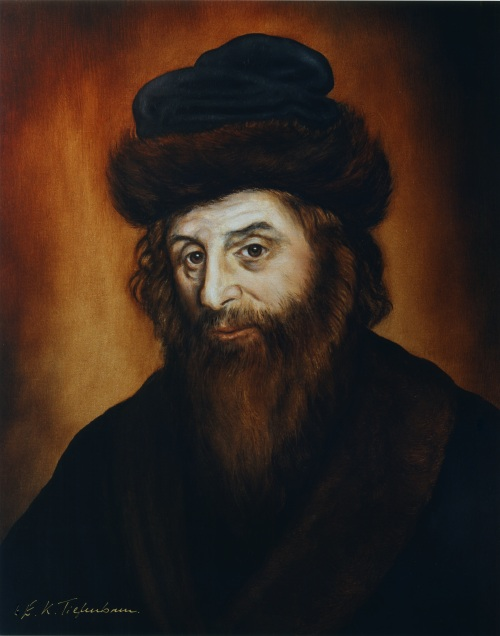 Rabbi Don Isaac Abrabanel (1437-1508): There are gates and doorposts that belong to an individual; these are parts of his home. There are also gates and doorposts that belong to a nation; these are if it’s national Homeland. 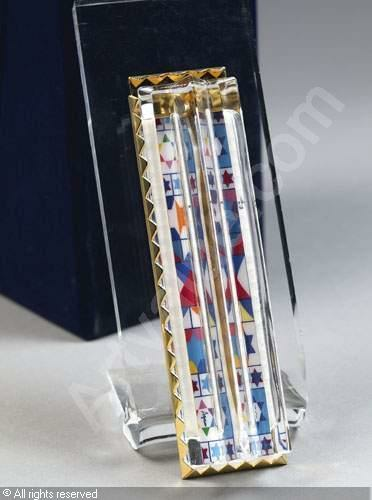 The Mezuzah is to remind us of the gift of Eretz Israel, the Jewish national homeland. Rabbi Moshe Alshich (1508-1593): What need is there to affix the Mezuzah to the doorposts of rooms within rooms? This is necessary, so that no one should think that only in public must he avoid doing wrong. The Mezuzah is a reminder that even in the innermost rooms where he imagines that he is isolated and all by himself, man must refrain from sin. Recanati: The Mezuzah affixed to the doorpost of a home serves as a protection against the messengers of evil. When confronted by the name of G-d, which is on the exterior of the Mezuzah, these messengers of harm realize that G-d is watching over this domicile and they will refrain from entering. The word Mezuzot is a combination of the words ‘zuz’ and ‘mavet’ which means literally: ‘Death: Remove thyself’. B. Sukkah 3b; B. Shabbat 32b, 103b; B. Berachot 15b; B. Sanhedrin 113a; B. Avodah Zarah 11a; B. Menachot 32b, 33a, 33b, 34a, 44a; B. Yoma 10b, 11a, 11b; J. Berachot, Chap 1, Halachah 5; J. Megillah, end of Chap 4; Mechilta Be-Shalach; Midrash Rabbah, Ki Tzetze, Chap 6, Sec. 3; Yad, Hilchot Mezuzah, Chap 5; Sefer h-mitzvot (Aseh) 15: Sefer Mitzvot Gadol (Aseh) 23; Sefer Mitzvot Katan 154, Shulchan Aruch, Yorah De’ah, 285; Sefer ha-Chinnuch, Mitzvah 423. Mezuzah = Jews Live Here! The word Mezuzah literally means doorpost. However, common usage of the term refers to parchments (usually encased in a strong material) that are attached to the doorpost. The two paragraphs of Shema – a Biblical quotation affirming the Oneness of G-d – are written on a parchment, placed in a container and affixed to the right doorpost of every door in the house. Throughout the world and throughout history, Mezuzuot (pl.) 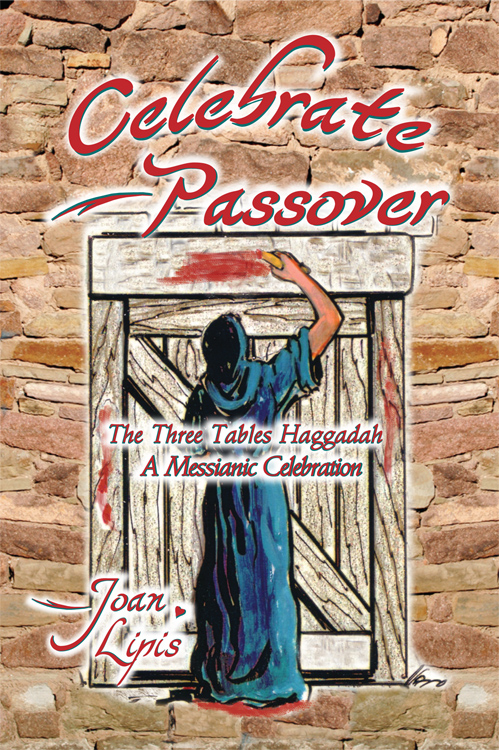 have adorned and identified Jewish homes. Mezuzot have been found in Qumran, Israel dating back about 2000 years. In the Old City of Jerusalem, rather than attaching the Mezuzah onto the doorpost, a niche was typically carved into the Jerusalem stone of the house doorpost and the parchment placed directly inside. In the ‘Moslem Quarter’ of the Old City as well in many pre-Shoah Eastern European Jewish communities, one can still identify former Jewish homes by the presence of a stone with a carved-out niche in the doorframe. 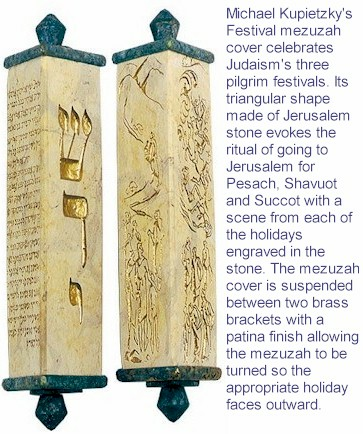 Volumes could be written on the rich history of the Mezuzah, from an artistic historical and sociological perspective. 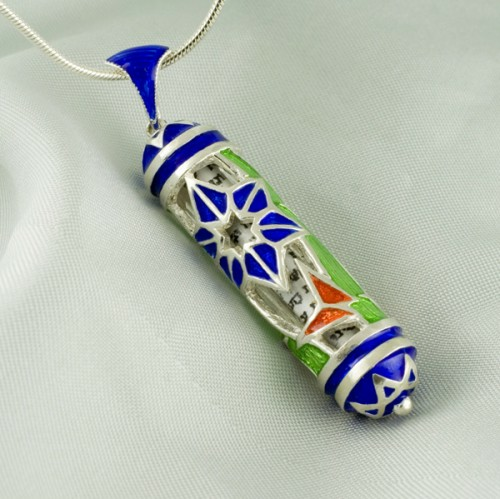 Artists have designed beautiful Mezuzah cases of sterling silver, marble, glass, wood and leather. In a kibbutz in the north of Israel, a farmer who works in the olive groves carves cases out of the olivewood that he cultivates. 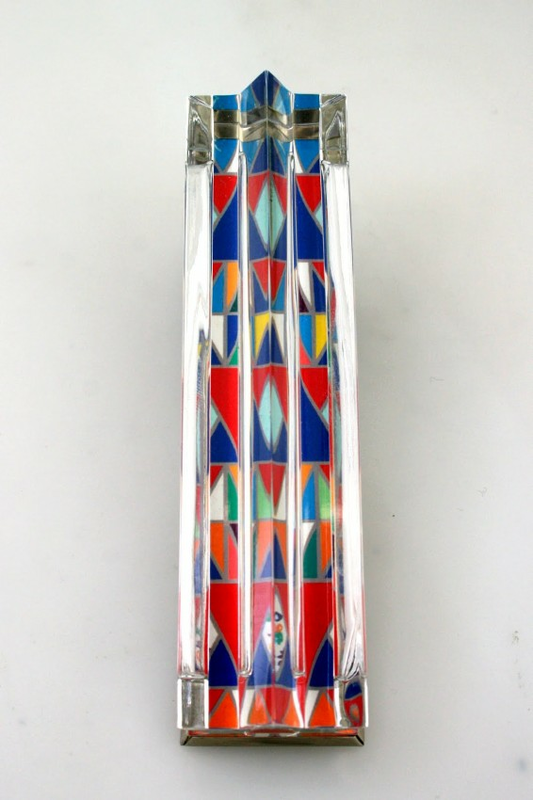 Mezuzot abound with the designs of renowned artists such as Marc Chagall (1887-1985) and Ron Agam (1958). From Singapore to San Francisco, Jewish homes are identified by the Mezuzah on the door. The outer case is only a container, however. 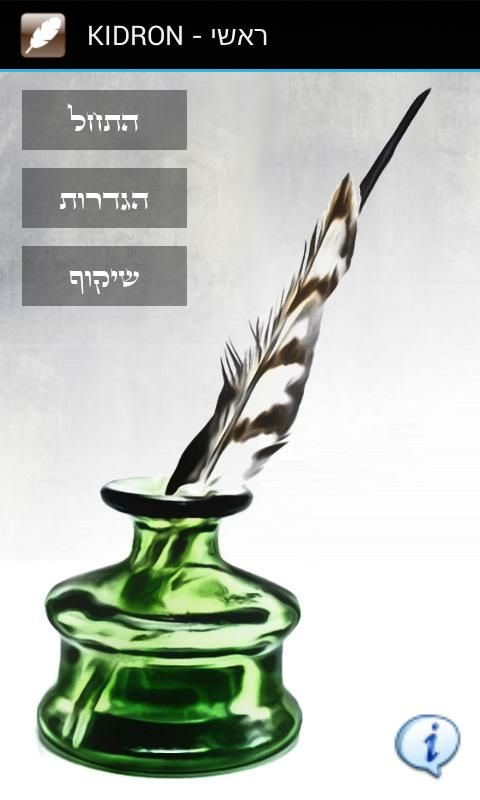 The true essence of the Mezuzah lies within, contained the words of Shema, so carefully written on the parchment. ‘...Write them (these words) on the doorposts (Mezuzot) of your house and upon your gates’. As noted above, the phrasing of the Torah commandment suggests that the words of Shema should be inscribed on the house itself, carved into its stones and bricks. 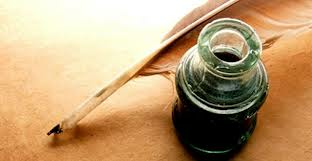 Since the Torah also specifies that the writing must be clear and precise, however, the Oral Tradition tells us that we are to write the paragraphs on parchments, which are then affixed to the doorpost. The Torah presents the commandment in this way to teach us that the effect of attaching a Mezuzah to a doorpost is to transform the entire house into an object of holiness. The parchments are written by a scribe, with special ink, in ‘Ktav Ashurit’, a special Hebrew lettering style used exclusively for the Torah, Tefillin and Mezuzah. Even a slight flaw in the writing will render the Mezuzah unfit for use. We can appreciate this need for precision by considering the production of computer chips, where even the slightest error can make them useless. The verses must be transcribed exactly as they appear in the Torah. Because the Torah is the word of G-d – whose perfections means that He is also completely perfect – every word, every letter and even the very shapes of the letters convey meaning and have significance. Jewish tradition teaches that in the merit of the Mezuzah G-d protects our houses. How does this happen? There is no magic involved, and the explanation is relatively simple. Because the degree of G-d’s involvement in our lives is directly proportional to the degree that we are conscious and aware of Him, the more that we are reminded of G-d’s presence, the more of His presence we will experience. 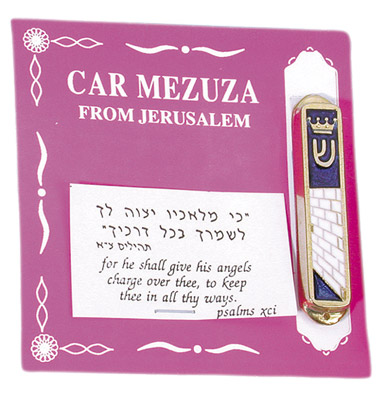 The Mezuzah is a vital element in creating and maintaining that awareness – and Divine protection is the result. ...Every time a person enters or leaves his house (and notes the Mezuzah on the doorpost), he will encounter the unity of the Name of the Holy One, Blessed be He, and remember His love, and will wake up from his slumber and his obsession with the frivolities of the moment. He will realize that there is nothing that exists eternally, except for the knowledge of the Rock of Ages. He will immediately turn to contemplation (of the truth) and will walk in the path of the just. Our ancient Sages said, ‘Anyone who has Tefillin on his head and arm, Tzitzit on his clothing and a Mezuzah on his door, is assured that he will not sin – for he has many reminders, and they (Tefillin, Tzitzit and Mezuzah) are the very angels that save him from sinning – as it says, ‘The Angel of G-d camps around the reverent ones and saves them (Ps;34:7). One obvious lesson that the Mezuzah teaches is that we should build homes on which the words of the Torah are indeed inscribed. Through our activities, speech, hospitality and family life we can transform the house itself into a holy object. This may explain the Talmudic law, which prohibits taking the Mezuzah off a house when leaving it. To do so, would be tantamount to destroying a holy object. 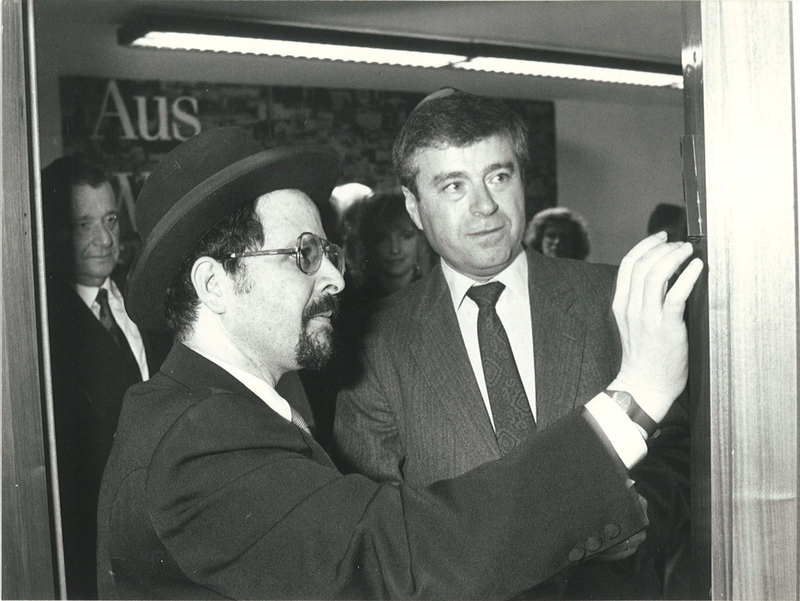 Left: Emeritus Chief Rabbi of United Kingdom, Rabbi Jonathan Sacks (1948). Right: The present Rebbe of Satmar, Rabbi Aaron Teitelbaum (1947). They are fixing a Mezuzah on a public Jewish building. 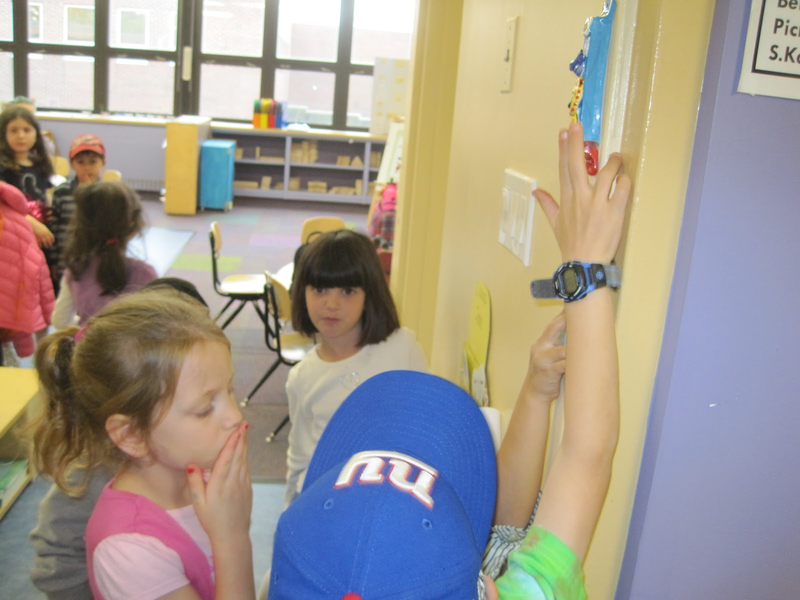 The Mezuzah serves as a constant reminder of key Jewish values. 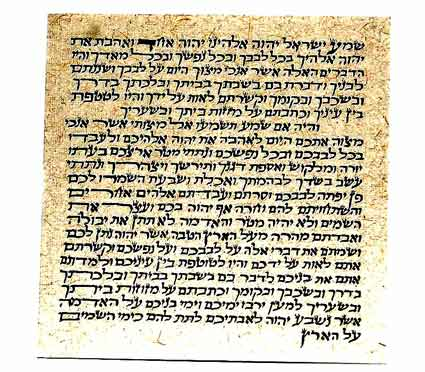 The two paragraphs inscribed on the parchment contain almost all of the most basic principles of Jewish belief. The first verse begins with the famous proclamation of G-d’s unity, ‘Shema Yisrael’, and continues with the ideas of love of G-d, the study of the Torah, the fulfilment of the commandments, Divine providence and the concept of reward and punishment. The Mezuzah reminds us of these ideas and increases our awareness of G-d’s presence in our lives. In order to remember the presence and significance of the Mezuzah, it is customary to touch the Mezuzah (some also kiss the fingers with which they touch the Mezuzah) as one passes through a doorway. Nachmanides (1194-1270) points out that the text of the verses, the parchment, and the Mezuzah’s position on the doorpost, virtually encapsulates all the major principles of the Torah. The parchment contains the words of Shema, the most fundamental statement of our faith in G-d. The Mezuzah is placed on the doorpost, just as the Jewish people in Egypt placed the blood of the Passover lamb on their doorposts, to show their allegiance to G-d and their devotion to His commandments. 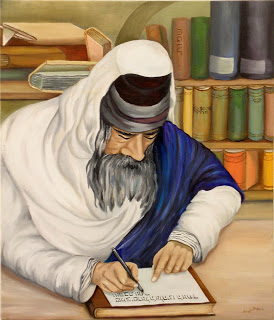 In two passages of the Torah (Deuteronomy 6:9 and 11:20), the Jew is commanded to write ‘these words’ (the first two paragraphs of the Shema) and affix them to the doorpost of his house. 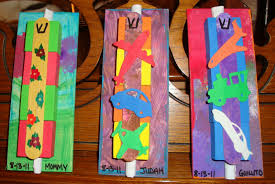 The Hebrew word Mezuzah, originally meaning a ‘doorpost’, has come to be used also to designate the hand-written scroll, which distinguishes the doors of a Jewish home. 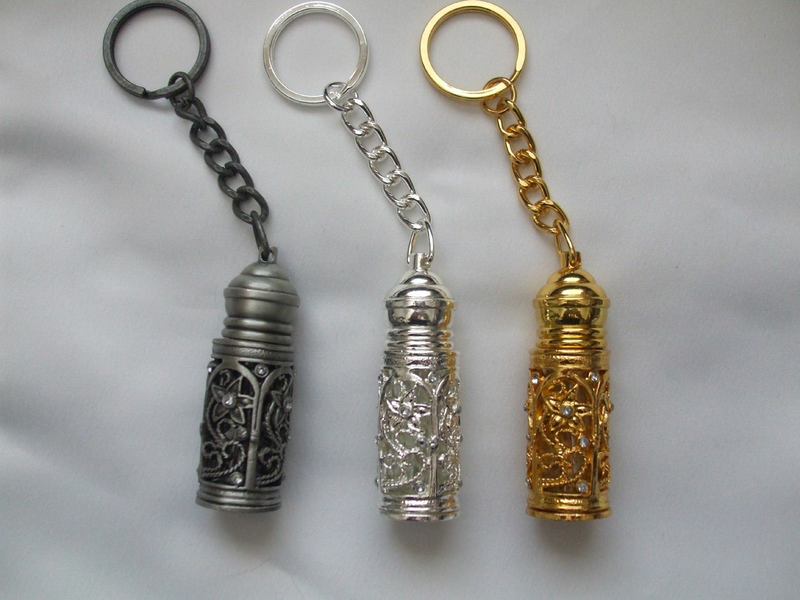 Various reasons and explanations have been suggested for the practice of affixing the Mezuzah. Some authorities lay stress on G-d’s promise (Deut.9:21) that observance of this commandment will be rewarded by length of life. 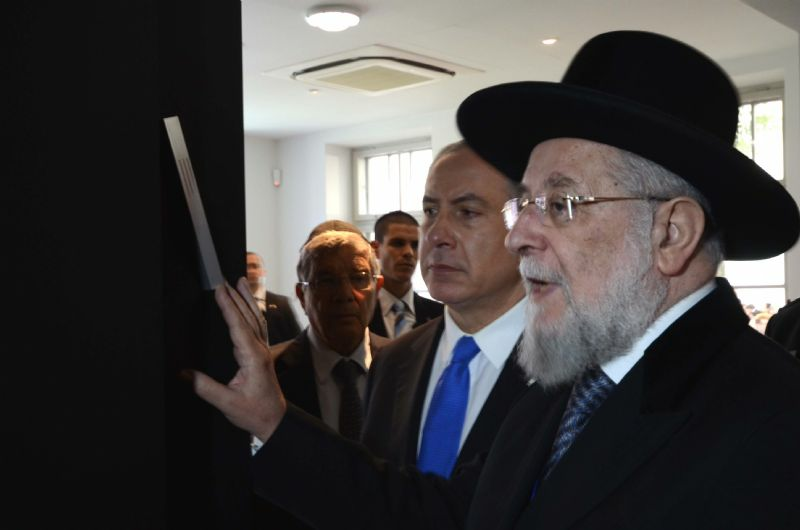 Others see a tangible symbol of the special relationship which exists between G-d and Israel in the Mezuzah. Whereas a human king sits in his palace while his soldiers stand guard outside to protect him, with Israel the position is reversed: the obedient Jew can stay at home secure in the protection of the Almighty, Who, by virtue of the Mezuzah, keeps guard over his door. While our appreciation of the Mitzvah is enriched by such explanations, our Rabbis are agreed that we need look no further than the twice-repeated precept of the Torah to prove the necessity for affixing a Mezuzah. The ‘Sefer Torah’ (Scroll of the Law), Tefillin and Mezuzah must all be written by hand upon parchment prepared from the skin of a kosher animal. (This means that only skins of kosher species of animals – such as cattle, sheep or goats – may be used for this purpose. It does not mean that the particular animal, from which the skin has been taken, must be ritually slaughtered). The reason seems obvious: it would not seem quite right to use parchment made from the skin of a forbidden animal. In addition, the Scriptural expression ‘that the law of the Lord may be in your mouth’ (Exodus 13:9), has been interpreted to mean that, for these kinds of ritual objects, only the skin of permitted animals may be used. The Torah specifically commands: ‘You shall write them’, which implies that printing, or any such mechanical or photographic method of reproduction would render the scroll ‘pasul’ (invalid). The last two letters of the Hebrew word ‘u’chetavtam’ (and you shall write them) from the word ‘tam’, meaning ‘perfect’, from which a number of typographical rules are derived. The expression ‘you shall write them’, is taken to convey that the passages in question must be written in their entirety, without any omission or imperfection. Even if only one letter is missing or wrongly written the whole Mezuzah is invalidated. Before being put into its case the parchment is rolled up in such a way that, when it is unravelled, the words ‘Shema Yisrael’ (‘Hear O Israel’) will be the first to appear. The affirmation of G-d’s unit must be the first words to greet the Jew when he unwinds the Mezuzah. After the appropriate blessing has been recited, the Mezuzah is affixed near the outer edge of the right-hand doorpost, (i.e. to the right of the person entering the house or room) more than two-thirds of the way up. The custom is to fix it diagonally upon the doorpost. This represents a compromise between two views, which were current among the medieval scholars, some of whom believed it should lie horizontally, while others insisted that it should be vertical. a) The entrance must be at least ten handbreadths in height. b) A Mezuzah is required for regular everyday residence but not for a synagogue (unless someone lives there). c) It must be a place of human habitation, not – for example – a stable or cowshed. d) It must be a place in which the occupants behave with dignity and propriety; this excludes a bathhouse or a toilet. What should a person do if he is too poor to afford both a Mezuzah for his home and Tefillin for his prayers? Which of the previous should he buy? Whichever choice he makes, he is on sound Halachic ground. He may prefer to purchase Tefillin, which, as ‘Chovat ha-Guf’, are his own personal obligation. If, on the other hand, he chooses to purchase a Mezuzah, he may argue that; where necessary, one can usually borrow a pair of Tefillin, whereas one could hardly borrow a Mezuzah affixed to the door of a neighbour! However, the acceptable thing to do in such circumstances is to buy Tefillin rather than a Mezuzah. 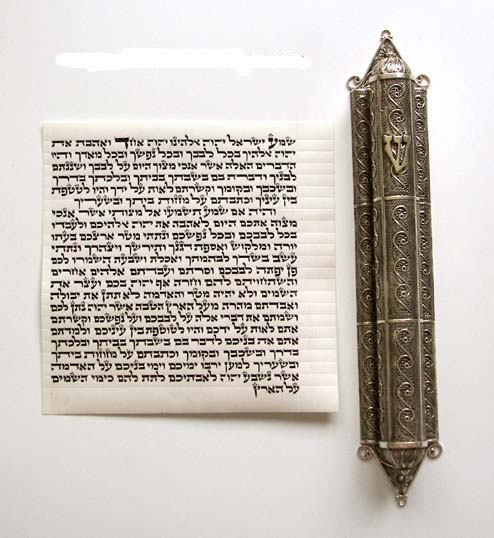 Since the Mezuzah is considered to have a somewhat lesser degree of sanctity than a ‘Sefer Torah’ or Tefillin, we are not permitted to take a sheet of parchment discarded from either of them and use it for a Mezuzah. The rule invariably is ‘ma’alin ba’kodesh ve’lo moridin’ – in religious matters, we must always ascend to a higher level and never descend to a lower. Mezuzot attached to the home of a private individual must be checked twice every seven years to ensure that not a letter or word has faded or peeled off from the parchment. In the case of a public Mezuzah, e.g., one affixed to a city gate, an inspection twice in fifty years is enough. The reason for this is that, if an examination had to be made more frequently, everyone in the city might plead that he had no time to attend to it and the Mezuzot would not be checked at all. 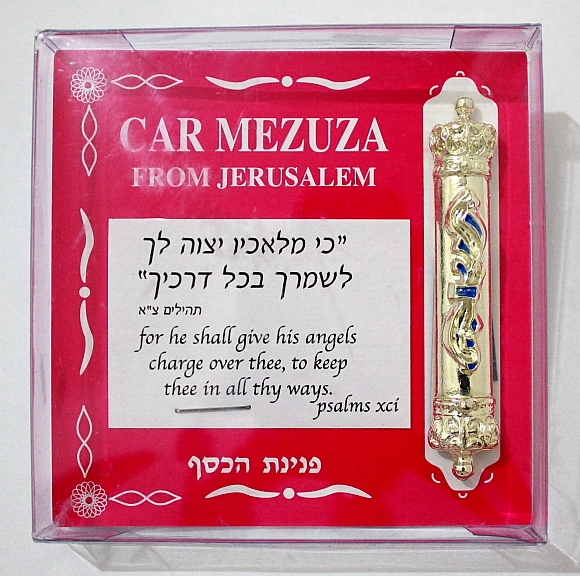 Car Mezuzah containing the Prayer for a safe journey. Putting up a Mezuzah is a positive commandment of the Torah, as stated in Deuteronomy 6:9, ‘You shall write them upon the doorposts (‘Mezuzot’) of your house, and on your gates’. The Mezuzah at the entrance to a house is the calling card of a Jewish home, and that is why it encompasses the essence of our faith – the first two paragraphs of the Shema, which we read twice a day: (Deuteronomy 6:4-9), ‘Hear, O Lord, the Lord if our G-d; the Lord is one’, and (Deuteronomy 11:13-21) ‘If you listen carefully to My commandments which I command you today’. The Mezuzah guards the house which has one on its door. Our Sages expanded considerably on the special qualities of this commandment, and added a great deal of emotional content to this commandment, which guards the gates of Jews. In the Talmud, Tractate,Tal.Bav;‘Avodah Zarah’ 11A, we are told about Onkelos (35-120 A.D.), the brother-in-law of a Roman emperor, who converted. The emperor did not like the fact that his brother-in-law had joined the Jewish People, a people which had been badly beaten after the fall of the Second Temple. He therefore sent a battalion of soldiers to seize him and to bring him to Rome in chains. Onkelos was taken from his home, dragged by the Roman soldiers, but as he got in the front door, he stopped and smiled. The Roman officer was amazed at the smile and asked him: ‘Why are you smiling’? Onkelos answered, ‘See how different the Jews are from the other nations. Among the other nations, the king remains in his palace, eats, drinks, sleeps, does whatever he wants, while his soldiers guard him from the outside. That is the palace of the soldiers – outside the door. Among the Jews, on the other hand, the situation is the exact opposite! We who serve Him sit inside our houses and do whatever we want to do, while the King guards us from outside’. As King David said in Psalms 121:8, ‘The Lord shall keep your going out and your coming in from this time forth, and even forevermore’. The Roman soldiers heard Onkelos’ explanation, were persuaded by his argument, and remained in the Land of Israel to learn Judaism. Rather than bringing Onkelos to Rome, the soldiers became Jews. That is the essence of the Mezuzah, which has G-d’s name (the letters ‘shin’, ‘daled’, ‘yud’) written on it, and sometimes merely the letter ‘shin’. This is one of G-d’s names, and it is also an acronym for ‘shomer daltot Yisrael’, ‘He Who guards Israel’s doors’. The Mezuzah at the door of one’s home, store, or office, is a clear indicator that it is a Jewish home. Many houses stolen by the accursed Nazi’s in World War II were later identified by the Jewish Mezuzah which was found at the entrance, indicating that Jews had lived there. 1. 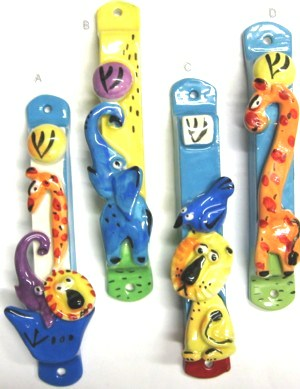 A Mezuzah must be affixed to the doorposts of a home in which Jews live. 2. The Mezuzah must be written on parchment by a qualified scribe, in accordance with Jewish law. 3. The Mezuzah should be placed on the doorpost which is on the right-hand side as one enters the room. Where possible; it should be placed on the outer part of the doorpost. The Mezuzah should be placed a little over two-thirds of the way up the doorframe, and should be firmly affixed to the doorpost (e.g., nailed, screwed or glued in place). 4. 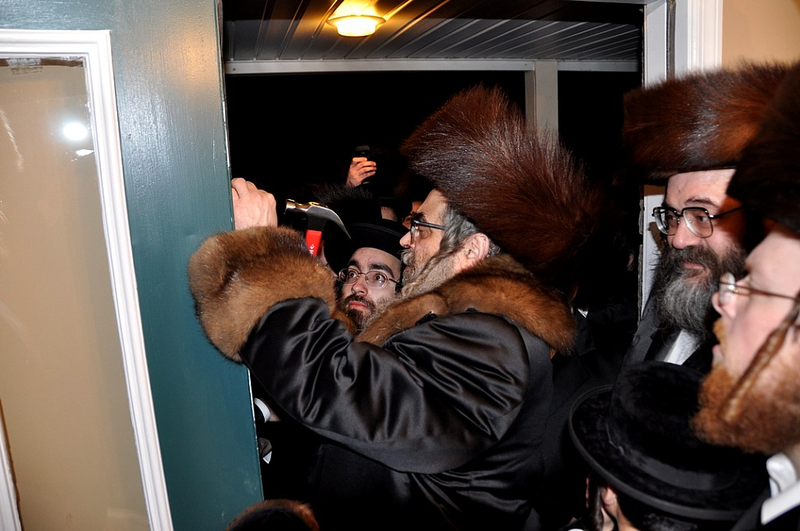 Sephardic Jews affix the Mezuzah in a vertical position, while Ashkenazi Jews slant the Mezuzah, with the top facing into the room. 5. The Mezuzah should be covered to protect it from the elements. 6. One should not affix a Mezuzah to the door of a bathroom, nor does one affix a Mezuzah to the door of any room that is less than 2.1 by 2.1 meter. 7. 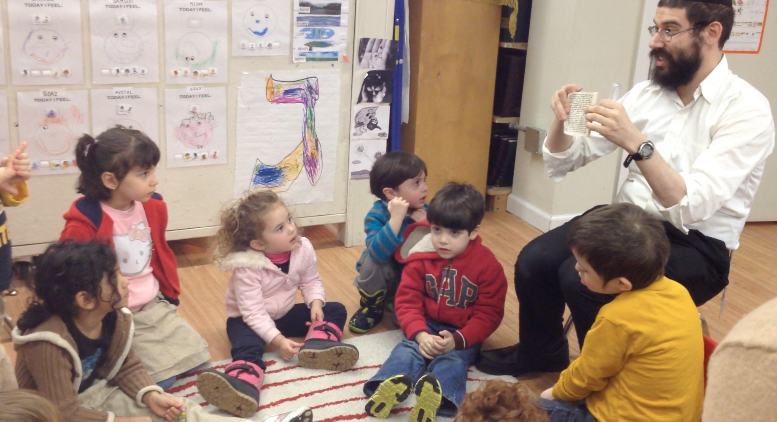 If one rents a house for longer than a 30-day period, Mezuzot must be put up. In Israel, one puts up a Mezuzah even if the house is rented for less than thirty days. 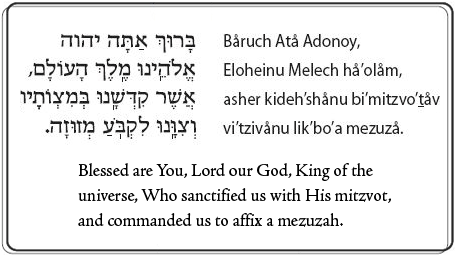 ‘Blessed are You, Our G-d, King of the universe, Who has sanctified us in His commandments and commanded us to affix a Mezuzah. 9. It is customary to touch the Mezuzah upon entering or leaving a room; some have the custom to kiss the fingers that touched the Mezuzah. 10. All Mezuzahs should be checked by a scribe for damage or deterioration twice in seven years. 50th death anniversary (‘Yarhzeit’) of my grandfather, Rabbi Chaim Yudah Daum,s.z.l.